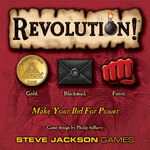 By now, you've heard of Revolution!, seen pictures of the components, and read reviews and session reports. But where did the game come from? The short answer: Philip duBarry. For the long answer, read his Designer's Notes. It's a great essay for both fans of the game and blossoming game creators.